Oh, how I wish my camera would accurately convey the tone of this room. Simply close your eyes and imagine droves of zombies a la The Walking Dead. And then you’ll witness the exact color in all it’s rotting glory. Do you see it?? Isn’t it wretched??? To make matters worse, the doorway of our hangout room is all that you see as you walk down our main hallway. It’s directly at the end. The focal point, if you will. And for three long months, I gritted my teeth every time I walked past. Here is the space the last time I showed it to you. We’d changed out the carpet and window and simply plopped down our stuff…. 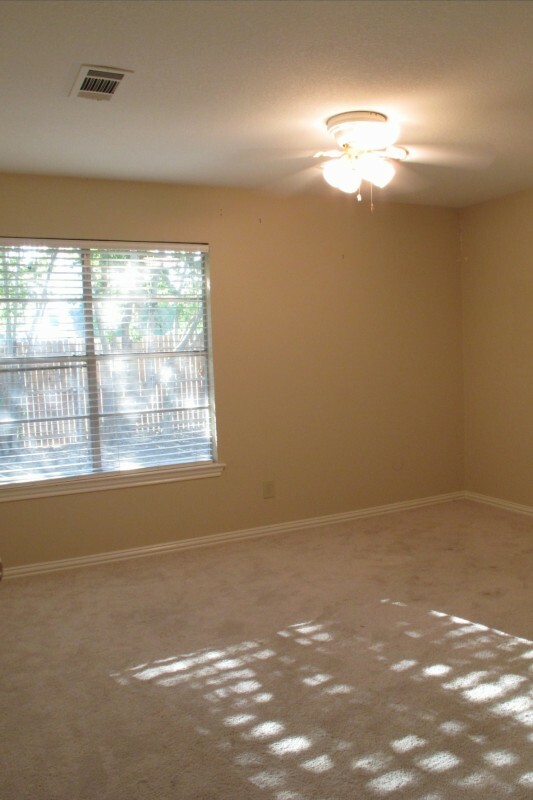 And now the room looks like this…. We still have a ways to go. I need to accessorize more to add warmth and softness, add a round mirror to the wall next to the window, new coffee table eventually, more couch pillows, floor pillows, etc. But, at least it’s no longer reminiscent of the un-dead. The soft grey color was actually an attempt to color-match the grey paint that runs throughout the main areas of the house. It came out close… but not close enough to act as touch-up paint for the existing color, unfortunately. So, I decided that rather than waste that gallon of paint, I’d simply use it in this room. Since it’ll act as another common space (when it’s not a guest room), I thought that extending the main house color into this space would be a nice transition. You may recognize these curtains as the flanking shower curtains from our last house. The height, pattern, and color work PERFECTLY in this space. I pretty much jumped around in excitement for the first few days after hanging them. And the thing is… I simply used the same shower curtain rings from our previous bathroom to hang them. Even though they’re stainless steel, thus, don’t match the oil-rubbed bronze rod, they look super cool and sleek. I initially thought that I’d use them as a placeholder until I found something new, but they’re staying. Because I love them. And they’re awesome. I guess you never know until you try. This painting is another piece of art created by my mother-in-law Mac. It was displayed in the master bedroom of our last house. 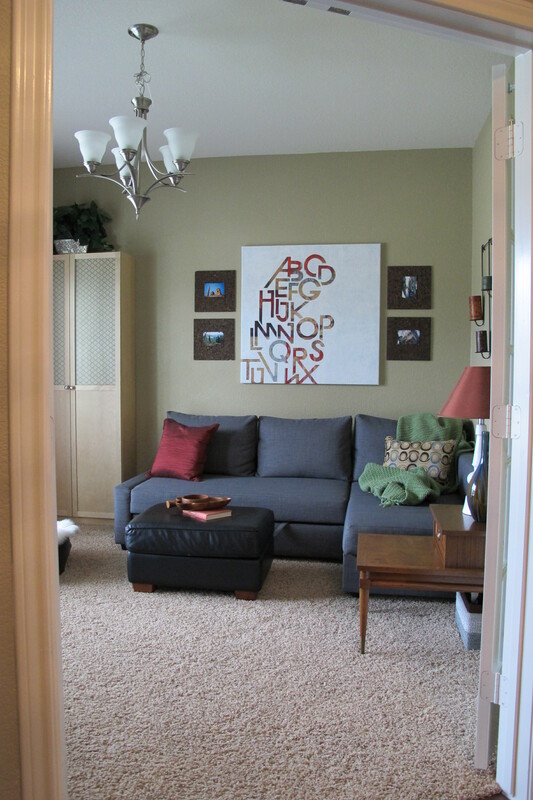 To create this piece, she glued foam letters onto the canvas, painted it green, then went crazy splatter painting it in other various tones of green. So super cool. We still have this blank wall, which is where we’re putting the TV. I’ll have another post for that. Now, it blends in and is much less offensive. And one more glamour shot for the road…. 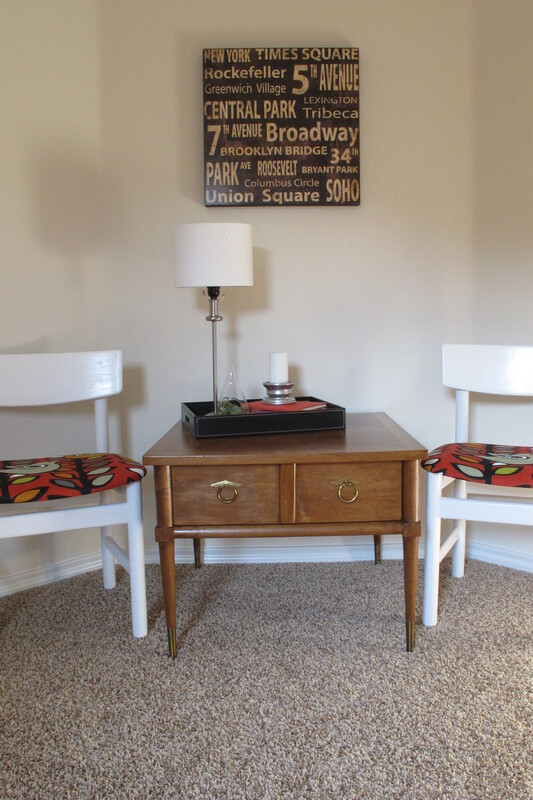 I love how my painstakingly refinished mid-century table looks in this room. It adds serious character and richness. Worth every frustrating moment if you ask me. I simply swapped out the lamp from Lucas’s room and it fits perfectly in the space. It adds some curvy contrast to all the straight lines going on. I have to say that I’m really happy with the direction that this room is headed. I have a few fun projects in store for the space, and once we get my mid-century media stand situated, I’ll have another update for the TV portion of this space. Yes, that was a modified Dumb and Dumber quote. Those who know me well, accept the fact that in the warm-weather months I speak fluent Dumb and Dumber (which seasonally transitions mid-November to fluent Elf). It just is. 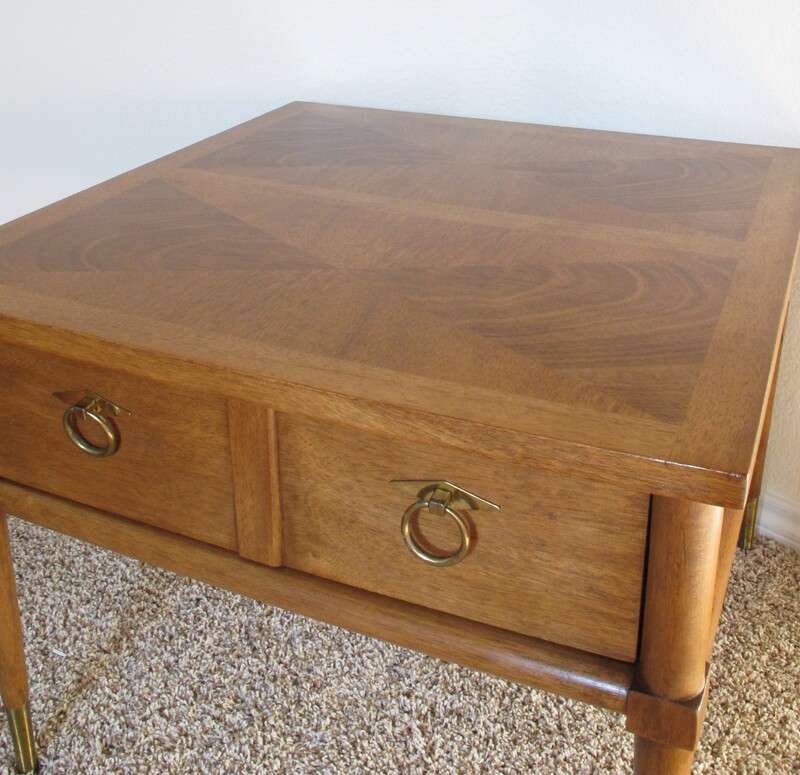 Anyhoo, not gonna lie… I definitely burned off all of the cookie-calories I consumed while stress-eating over this thing throughout the dual-refinishing process, and it was worth EVERY SECOND. I’ve learned so stinkin’ much throughout this process, and finally have a result I’m satisfied with. So, let’s start with a quick recap for any newbies. 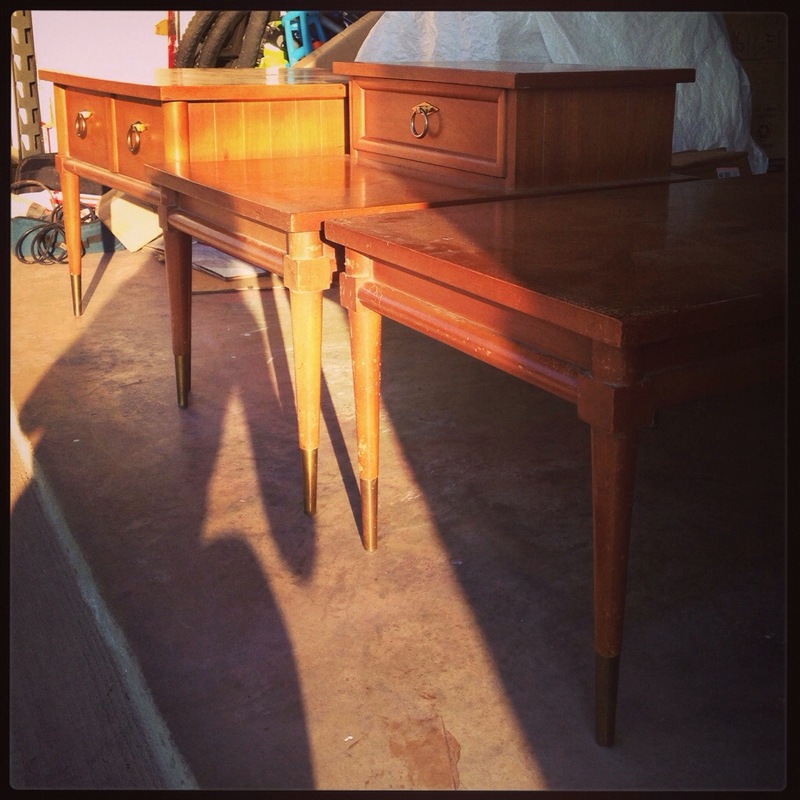 I purchased these drool-worthy mid-century tables for a steal at Goodwill. The problem was that their finishes had seen better days. 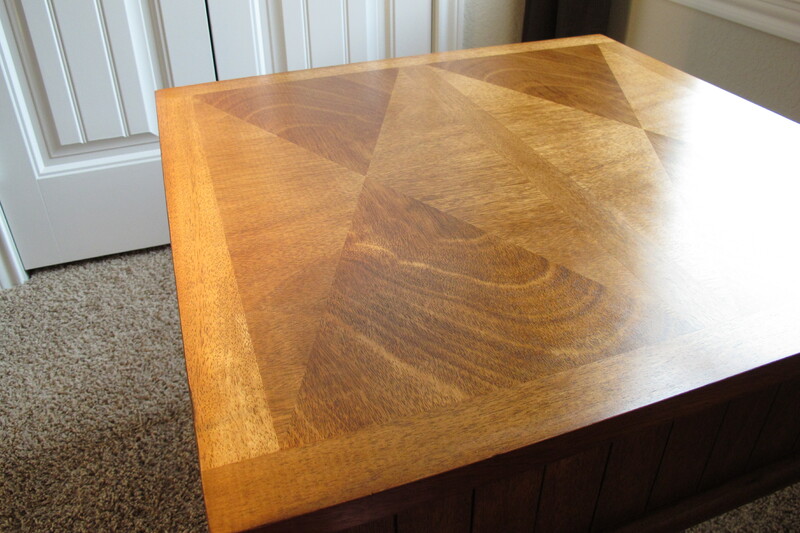 Happily, I was able to salvage the original finish on the smallest table by using mayonnaise to remove water rings. 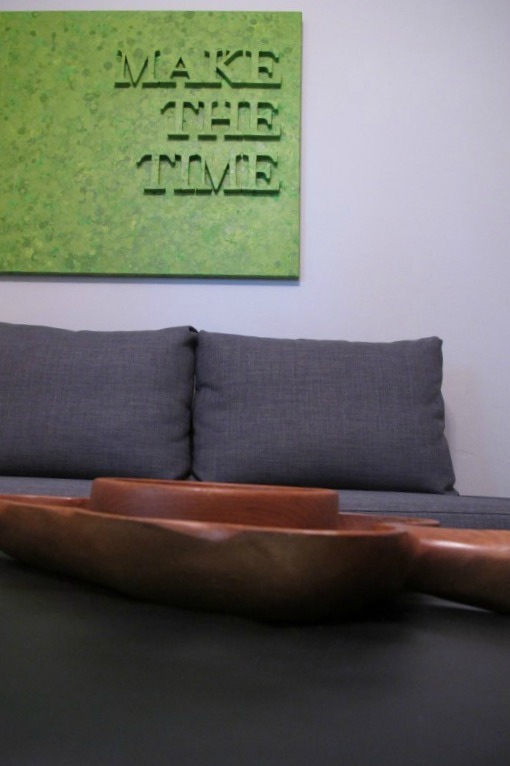 That guy now lives in our tri-functional room…. 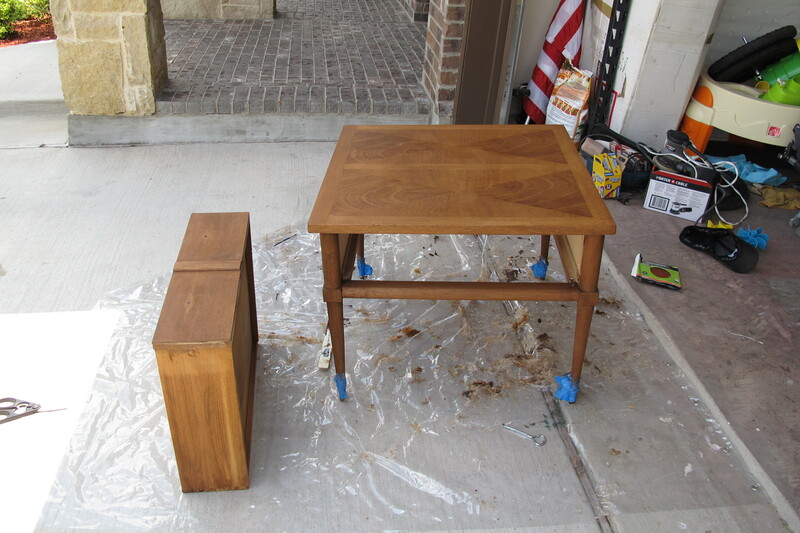 I began work on the coffee table (which is still not finished), but ended up switching gears to the larger end table. 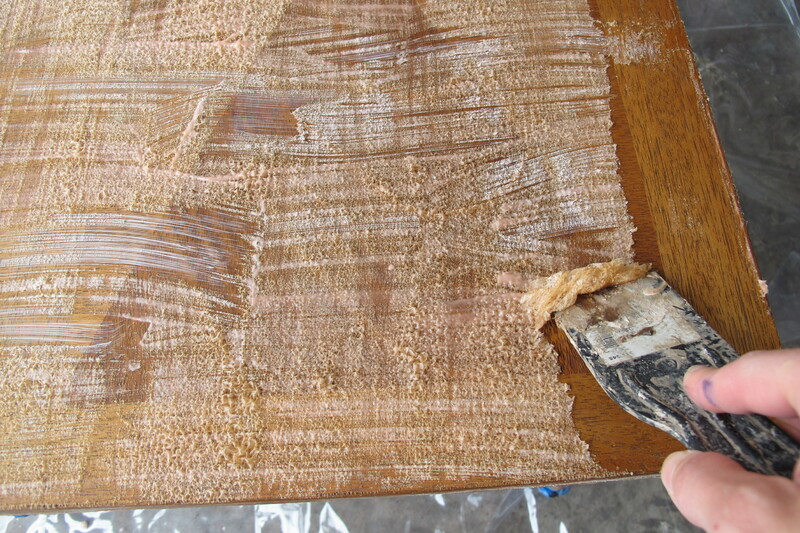 I stripped the table with chemical stripper, then stained and finished the table with a water-based poly… which ended up being a HUGE mistake resulting in bubbles and brush strokes galore (and a pathetic-ugly-crying-Christina). So, it was onto attempt número dos. After my cries for advice were answered by several sweet folks, I came to terms with the fact that I would have to re-strip the table. Check out the comments from my previous two posts for the specific advice given. 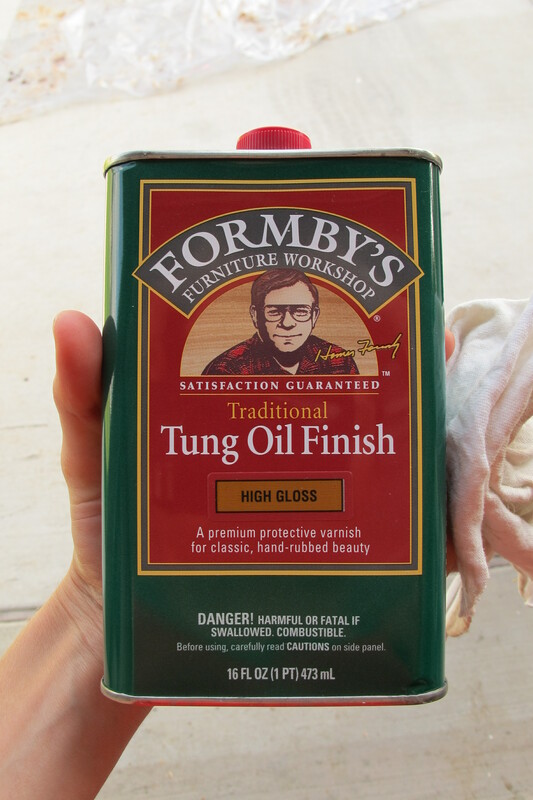 Once the table was fully stripped, I decided to use Formby’s Tung Oil. This was a product recommended by several awesome folks (including Beck), so I figured I’d give it a go. After a short deliberation, I decided to apply the Tung Oil sans stain to bring out the natural tones of the wood… Problem??? I don’t think I properly prepped the top of the table… My fear of over-stripping the wood (being that this was my second go-around) had prevented me from removing all the film. With the first coat of Tung oil, the top looked mottled and ashy. NOT the look I was going for. And I realized that I should’ve stained the table first. I just really liked that look so much better. I didn’t take a picture of this part as my frustration got the best of me. Thus, grabbing my camera slipped my mind. But, take my advice… Do a good job stripping the first (‘er, second) time. You won’t regret it. At this point, I went inside, ate another cookie, repeated the mantra “At least I only have to strip the top. 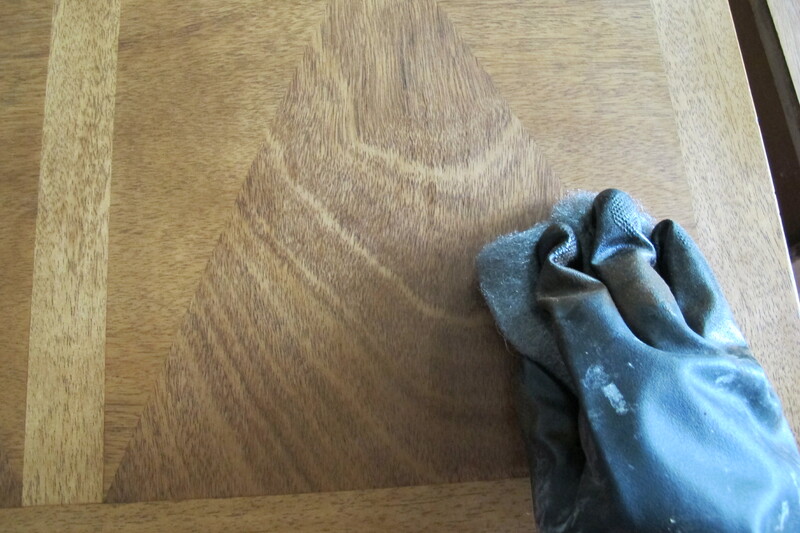 At least I only have to strip the top…” then decided to risk sanding the top of the table. I say “risk” because of the thin veneer that I was so scared to sand through. I didn’t want to use the stripper again because my understanding was that tung oil penetrates the wood so I figured that if I wanted an evenly stained top, I’d need to sand. I very, very carefully sanded with 220 grit sandpaper on my orbital sander. And I DID IT. I sanded just enough to allow the stain to evenly penetrate but before I went through the veneer. The wood took the stain much more readily this go-around, which resulted in a slightly darker finish than before, but I’m okay with that. It looks rich and luscious while still boasting a mid-century flair. If the table were a person, he’d totally be swinging his flowing locks back and forth in slow motion as Hungry Eyes plays softly in the background. 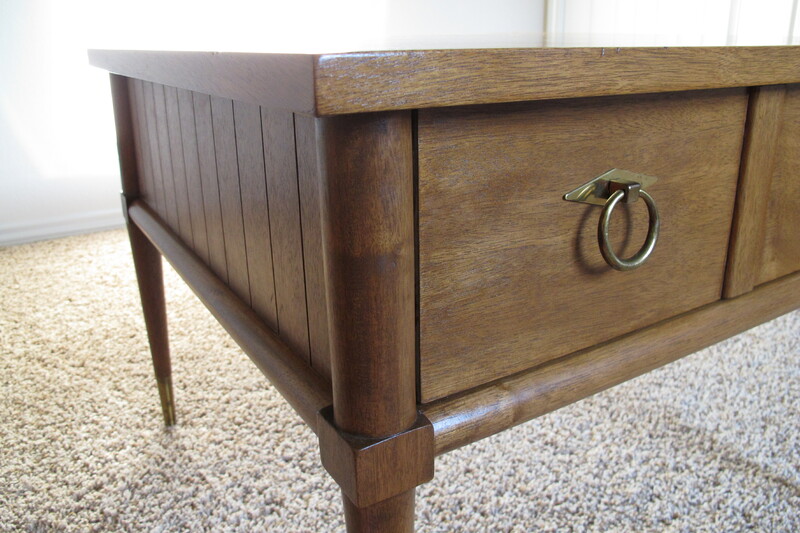 …cleaned with tack cloth, and applied a second coat. I repeated this process again on the entire table, then two more times on just the top and drawer until I had an even finish all over. I still think the the base could use one last coat, just to add a tad of extra gloss, so I may still do that. But I guess that’s the beauty of this stuff. You can add layers to enhance as needed. Applying the tung oil was a process because of the long dry time (12 hours between coats per the instructions), but really it was easy and quick to apply aside from that. And totally worth it. I wish I had known about this stuff the first time around. In any case, now my table is now glossy and done (please excuse the weird lighting in these pics… I think I chose an interesting time of day to shoot them)…. And check out the top!! The damaged spot is a smidge darker than the rest of the top, but that’s the only difference. It feels smooth as can be…. Amazing to me, especially being that the top started off here…. 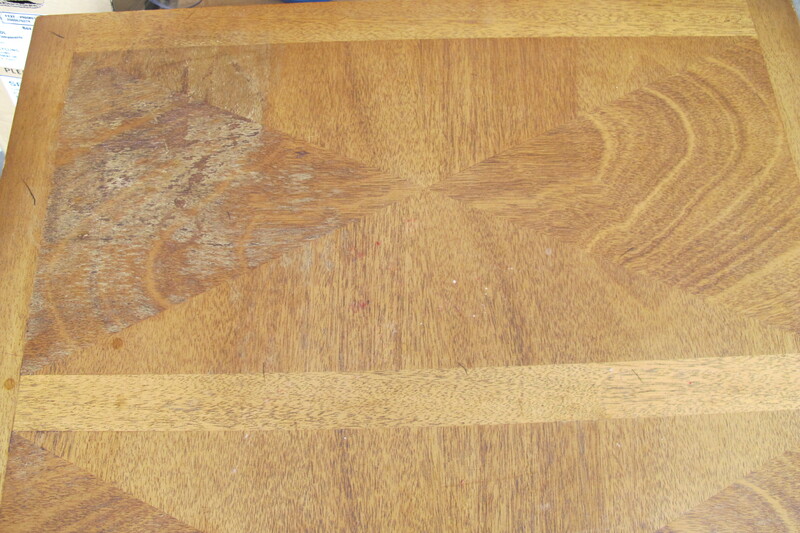 Remember how I questioned whether I’d even be able to stain the table because the damage went so deeply into the wood?? 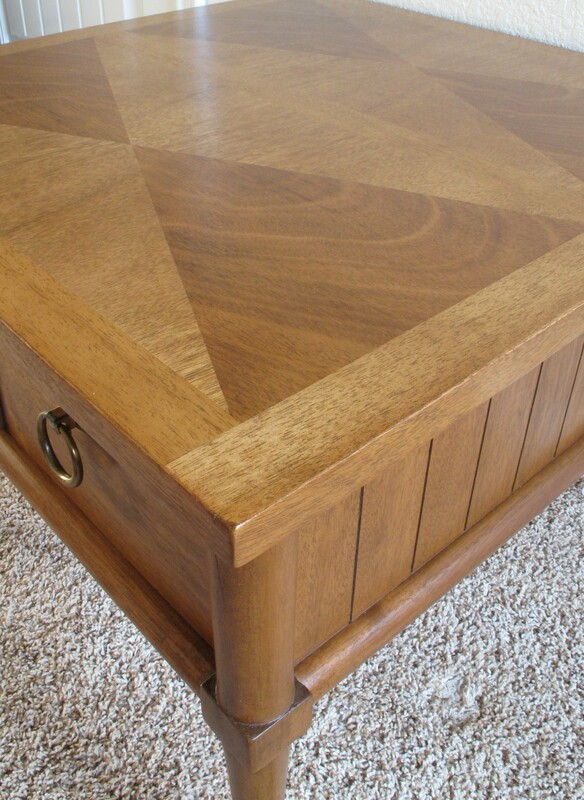 The fact that I was able to salvage that inlaid detailing on the top makes me absolutely over the moon. I was thinking of selling the table once I was finished, but after all the work I put in, this little guy feels like part of the family. I’m THAT attached. 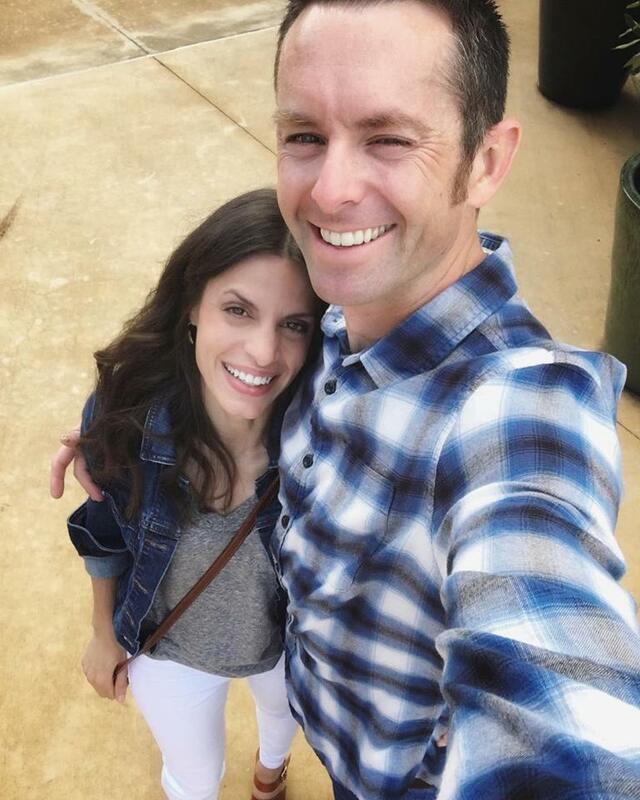 So, I’m gonna hang onto him and let him live in our totally mis-matched, not nearly decorated No Man’s Land for a while until I figure out a permanent space for him. And I must name him. For some reason he feels like an “Earl”. Maybe we’ll just go with that. 5. How many cookies it takes for me to survive refinishing a table twice within a short period of time (twelve). Nice, right??? So, on that Hallmark note, I end this post. What DIY adventures have y’all taken on where you nearly (but didn’t) throw in the towel?